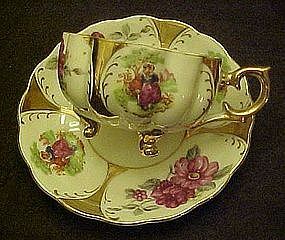 Beautiful cup and saucer with alternating panels of pink flowers and a scene of a colonial couple. Large gold borders of gold, with gold on the legs, handle and edge trim. The cup is thin and scalloped with a lustre mother of pearl finish inside. The legs on the cup are elegant little curls. The set is in pristine condition. Stamped Classica 22kt gold hand painted, with a horse on the backstamp.